Lately I’ve been so drawn to flowy pieces. (Should be noted at this point I’m not pregnant, I just really like when absolutely nothing is touching my body.) I was looking around bloom at our fall merchandise the other day and thought “yep, I’m either turning into a grandmother or Rachel Zoe.” I’m kind of okay with either at this point. Comfortable and chic – right up my alley! Love it. Those shoes are amazing ! I’ve heard the term “ombre” on Project Runway for years… and only recently learned what the heck it meant. So when I was scrolling through the photos, I said “I think I’ve spotted Ombre in real life!” So, thanks for mentioning it … I’m so happy with my new vocabulary addition. You are rarely seen in Jeans. But you look really good in them! I love the flowing look in summer. When it’s 105 in Dallas, who wants anything touching your body? And since people tend to frown upon running around naked everyday, flowing is the way to go! I love that tunic! 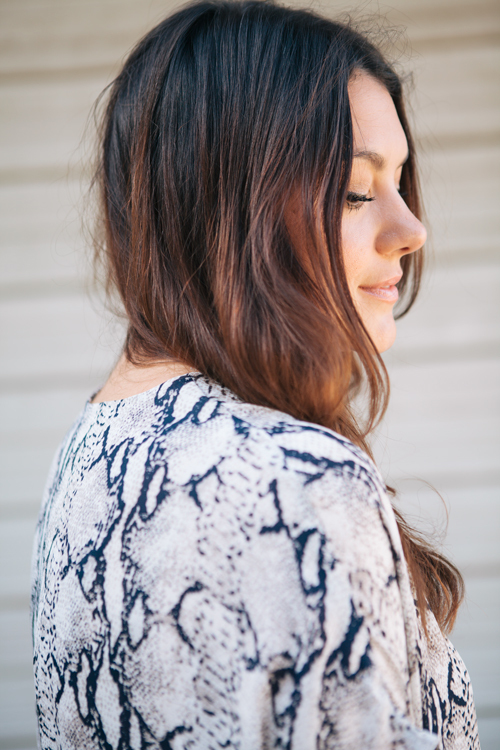 Totally agree about the flowy pieces… the older I’m getting the more I realize comfort is key! it looks ombre and I think you should just embrace it, which you clearly have done… especially on the grandmother/rachel zoe front. I love the boho look, I’m terrible at it as I may pair something “boho” with a pair of pearl studs or something. Haha you are to funny! I really like the causual boho look on you. You could pull off any style! I think the unintentional ombre look is really pretty! it’s very subtle, but the colors still work well together. and I really like the colorblocking on that purse – so cute. so gorgeous! i love those shoes! Cute – very boho! Love the flowiness of that top. I’m a huge fan of boho-pieces, I love this top and those shoes! Well, either way, your hair looks awesome! How long do you go between hair washes, if you don’t mind my asking? of course i don’t mind! this was day one, i’m currently on day two (so tomorrow’s photos). if i can go 4 days, that’s what i prefer. usually day 1-2 are worn down and then 3-4 are up! Suave dry shampoo is my jam. I love that one, too. At first the peach-y smell bothered me but it’s grown on me. Thanks for responding! I always wonder what other people do with their hair when they don’t wash it everyday. 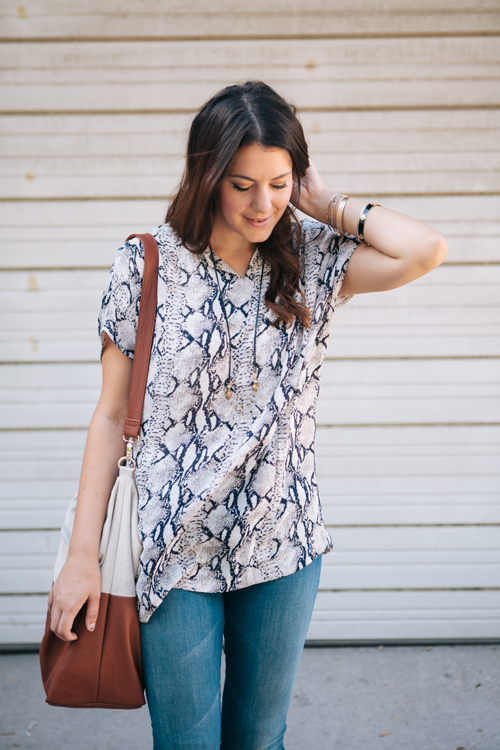 Love the flowy snake print tunic! If it wasn’t for all my stray, gray hairs I’d do this myself as well. Let it grow and just keep the roots my natural color. I love the look and since your hair is darker it blends so well! your hair looks wonderful … just keep rocking it!! I love the pattern on that top! Everyone needs a flowy outfit from time to time. I’m loving those shoes, but they must make you about 7 feet tall! Go you for rocking the platform heels as a tall girl. Love it! The light in these photos is just beautiful! Nothing feels better than a tent top. 🙂 One part cozy, one part hippie chic (because snakeskin makes anything chic) I hear ya! Kendi, you look lovely! Don’t you love Mother jeans? LOVE them. They fit like a glove and are so comfortable! 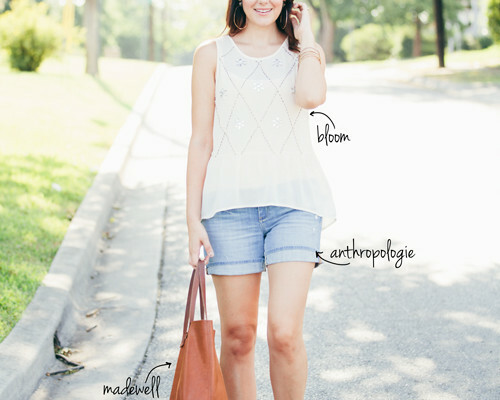 Love that top and also adoring those wedges, Amazing! I’m loving your hair AND your makeup! It always looks so fresh. Any tips on applying your eyeliner? It looks amazing in that last photo. Would love to know what brand/color you use. You look fabulous in those jeans! I am also a big fan of flowy pieces recently. Thanks for sharing! LOL! If you don’t want anything touching your body, you’re likely to stay unpregnant. 🙂 BTW you look gorgeous. Your inner glow is very becoming. hahaha that’s a good point and that’s the plan, my friend. I would pay good money to have my hair look like that! Also, don’t feel bad about ‘just’ talking about your hair. I told a friend recently that I’m not a well-rounded individual, and I’m totally okay with it. I can talk about my faith, my kids, and clothes. That’s about it! welcome to the artsy almost-grandma/ombre-something hair club, we’re happy to have you! xoxo ps- you look great! give yourself a hug for me! I love those shoes! To die for. I switched over to ombre-ish hair (I’m already blonde and it’s just slightly blonder at the ends) but it has saved me a ton of hassle with getting my hair done. Turning into Rachel Zoe is definitely fine, that means you have an amazing style! Love that top, the print is fabulous and love the loose fit. Adore the camel accents, that bag is amaze! Alway so effortless. Don’t feel ashamed, I think no matter what you write its just you being yourself, so we love to read it, because your great. This is one of my favorite looks so far on you! LOVE the top, I might have to stop in and get it! And once you mentioned RZ I was like, yep, that’s why I love it! Flowy clothes are kind of the best. Ha! “yep, I’m either turning into a grandmother or Rachel Zoe.” — I also think that with the Texas heat you just CAN’T wear a tight/clingy shirt. 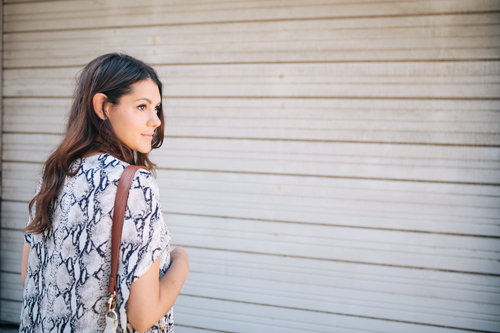 Silky and breezy is the only way to go and still look chic instead of sweaty. Great hearing you speak on Sunday! I noticed your hair as well. lol I’m loving it…and it’s looking long!! I’m obsessed with this outfit!! LOVE!! I've heard the term "ombre" on Project Runway for years… and only recently learned what the heck it meant. So when I was scrolling through the photos, I said "I think I've spotted Ombre in real life!" So, thanks for mentioning it … I'm so happy with my new vocabulary addition. I love the flowing look in summer. When it's 105 in Dallas, who wants anything touching your body? And since people tend to frown upon running around naked everyday, flowing is the way to go! And I think your hair is pretty! It looks natural, like you're one of the those lucky people who can say, "Oh this? It's just my natural color!" Ha. I’ve written entire posts on my hair…on purpose. No shame. And super cute outfit! I love that tunic! 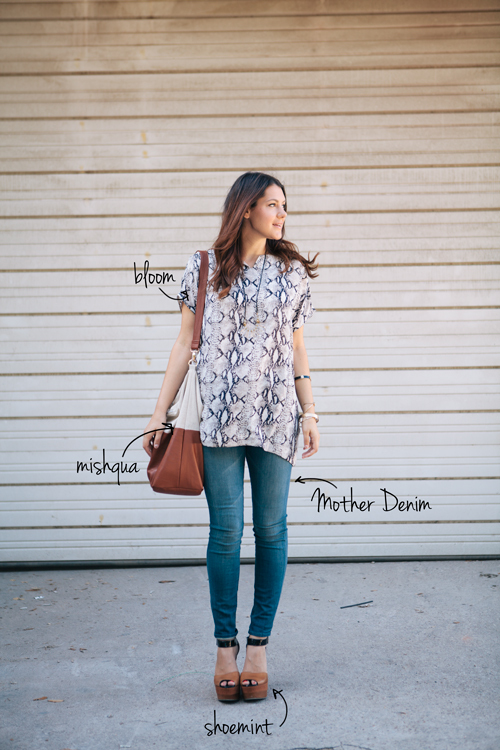 Totally agree about the flowy pieces… the older I'm getting the more I realize comfort is key! it looks ombre and I think you should just embrace it, which you clearly have done… especially on the grandmother/rachel zoe front. I love the boho look, I'm terrible at it as I may pair something "boho" with a pair of pearl studs or something. I think the unintentional ombre look is really pretty! it's very subtle, but the colors still work well together. and I really like the colorblocking on that purse – so cute. I guess everyone loved your shirt cause it’s sold out! It’s beautiful!! I'm a huge fan of boho-pieces, I love this top and those shoes! Well, either way, your hair looks awesome! How long do you go between hair washes, if you don't mind my asking? That top is fantastic! I see that it’s sold out at bloom. Any chance you’ll get any more in stock, or you’ll reveal what brand it is? If it wasn't for all my stray, gray hairs I'd do this myself as well. Let it grow and just keep the roots my natural color. I love the look and since your hair is darker it blends so well! love the top! and your unintentional ombre looks fantastic! I'm loving those shoes, but they must make you about 7 feet tall! Go you for rocking the platform heels as a tall girl. Love it! Kendi, you look lovely! Don't you love Mother jeans? I'm loving your hair AND your makeup! It always looks so fresh. Any tips on applying your eyeliner? It looks amazing in that last photo. Would love to know what brand/color you use. of course i don't mind! this was day one, i'm currently on day two (so tomorrow's photos). if i can go 4 days, that's what i prefer. usually day 1-2 are worn down and then 3-4 are up! Suave dry shampoo is my jam. LOL! If you don't want anything touching your body, you're likely to stay unpregnant. 🙂 BTW you look gorgeous. Your inner glow is very becoming. Also, don't feel bad about 'just' talking about your hair. I told a friend recently that I'm not a well-rounded individual, and I'm totally okay with it. I can talk about my faith, my kids, and clothes. That's about it! welcome to the artsy almost-grandma/ombre-something hair club, we're happy to have you! xoxo ps- you look great! hahaha that's a good point and that's the plan, my friend. I switched over to ombre-ish hair (I'm already blonde and it's just slightly blonder at the ends) but it has saved me a ton of hassle with getting my hair done. This is the ultimate outfit! Skinnies and a blousy top. You always look fabulous Kendie. Alway so effortless. Don't feel ashamed, I think no matter what you write its just you being yourself, so we love to read it, because your great. This is one of my favorite looks so far on you! LOVE the top, I might have to stop in and get it! And once you mentioned RZ I was like, yep, that's why I love it! Flowy clothes are kind of the best. That top is so perfect — looks so flowy and comfortable but it’s still put together and pretty! I believe I was one of the people who asked about your ombre hair, so thanks for the info. I haven’t slept in days. Sarah — I hope you were able to get a full and sound night’s rest last night knowing the truth about my hair. Ha! "yep, I'm either turning into a grandmother or Rachel Zoe." — I also think that with the Texas heat you just CAN'T wear a tight/clingy shirt. Silky and breezy is the only way to go and still look chic instead of sweaty. I noticed your hair as well. lol I'm loving it…and it's looking long!! I'm obsessed with this outfit!! LOVE!! I love that one, too. At first the peach-y smell bothered me but it's grown on me. Thanks for responding! I always wonder what other people do with their hair when they don't wash it everyday. Ha. I've written entire posts on my hair…on purpose. No shame. And super cute outfit! Those shoes = PERFECTION. Oh my word, they are cute! I guess everyone loved your shirt cause it's sold out! It's beautiful!! That top is fantastic! I see that it's sold out at bloom. Any chance you'll get any more in stock, or you'll reveal what brand it is? Guuuurrrrrllll this outfit is fab but you are wearing some TALL SHOES. I bought the Seychelles wedges you wore once (that look a little like stacked loafers?) and they might be too tall for me to wear on the regular. :/ How do you do it?! Love your hair! I have been wanting to do an ombre look for a while now, but I’m not brave enough to take the plunge. I stopped dying my hair 10 years ago and I am scared to death to start again. Hair color maintenance is so much time and money! Amazing, those shoes are to die for!! your hair looks gorgeous and i really love those shoes with the jeans! looking beautiful! Really like this look, very different from your usual outfits, tempts me to experiment and add flowy pieces to my wardrobe. I love everything about this look, and I think the ombre adds to the boho look for sure! 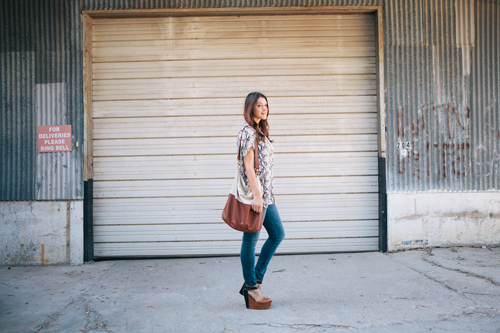 Ombre, flowy tops, skinnies, and wedges–girl after my own heart–these are my personal favs on myself. That top is so perfect — looks so flowy and comfortable but it's still put together and pretty! Your outfit, handbag and shoes everything is beautiful. Fabulous! I believe I was one of the people who asked about your ombre hair, so thanks for the info. I haven't slept in days. Love your hair! I have been wanting to do an ombre look for a while now, but I'm not brave enough to take the plunge. I stopped dying my hair 10 years ago and I am scared to death to start again. Hair color maintenance is so much time and money! Love this outfit, and your makeup is flawless. Gorge! This outfit is fabulous! Comfy, casual, chic. winning combo if you ask me. Where do you get your hair cut in the Dallas area? Sarah — I hope you were able to get a full and sound night's rest last night knowing the truth about my hair. Loving this outfit on you! Those heels are amazing! such a perfect outfit – loving that shirt! who makes the shoes in the pics? Beautiful! Love those SHOES! My oh my. “PREGNANT!” was flashing in my mind after I read your first sentence, so your second sentence was totally fitting. I love this look, by the way! So comfortably chic! "PREGNANT!" was flashing in my mind after I read your first sentence, so your second sentence was totally fitting. I love this look, by the way! So comfortably chic! I think your hair looks fabulous! I hope to become Rachel Zoe one day, so this is right up my alley. Though I know the jeans are colored, I can’t help wishing for a bit MORE color. Maybe with your necklace next time? I hope to become Rachel Zoe one day, so this is right up my alley. Though I know the jeans are colored, I can't help wishing for a bit MORE color. Maybe with your necklace next time? 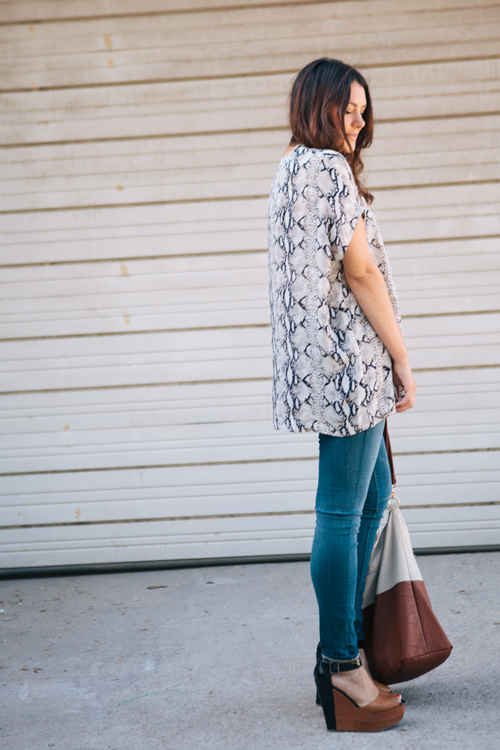 I love a loose flowy top and skinny jeans! It’s always comfy and cute! And I am always a fan of ombre hair. 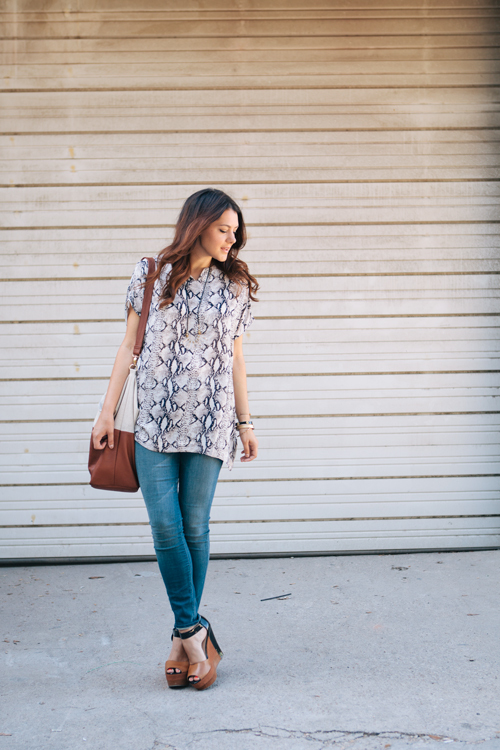 I love a loose flowy top and skinny jeans! It's always comfy and cute! And I am always a fan of ombre hair. That is a total everything bag…Love It!!! You always have the best taste in handbags.